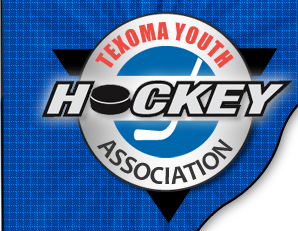 The Texoma Youth Hockey Association (TYHA) was founded to introduce young boys and girls of the Wichita Falls community to the rapidly growing international sport of Ice Hockey. The four guiding principles/goals of the TYHA are to promote teamwork, a positive attitude, love of the game, and skill development. Instilling a sense of pride in the community and teaching the ideals of fair play and good sportsmanship are important to help make each player “well-rounded”. By supplying various stages and levels of competence, the TYHA hopes that all players can find others of their ability to promote a feeling of achievement and success through advancement to the next level. The TYHA recognizes that developing Mini-Mite and Mite players (boys and girls ages 5 thru 8), introducing new families to hockey with an excellent experience and creating new coaches/officials is crucial to the success of youth hockey in the Wichita Falls and surrounding areas. Coaches and team members are expected to do their best at all times. The TYHA wants individual players to learn the importance of hard work, practice, and doing their best, both as individuals and as a team. To accomplish these goals, the TYHA supports a level of playing ability for the House program based on age in accordance with USA Hockey guidelines. Currently, our House program competes in the Dallas Stars Youth Hockey League (DSYHL), and the AT&T Metroplex High School Hockey League, two well established youth hockey leagues since the late 1990s. Through hard work, practice and discipline we are looking forward to seeing your children develop as fine young athletes.